inspiration for changing up my bedroom..does anyone know who makes the fabric on the bottom image? 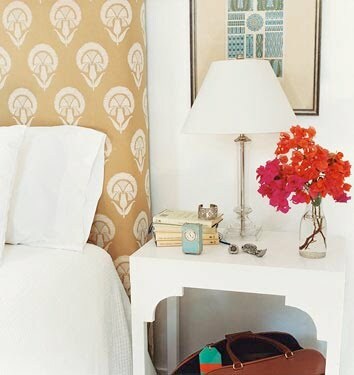 i know its from India Hicks home..
i have the bedside table from the top image..how fab is that wallpaper?! so many details from both of these..i adore! Oooo I love that wallpaper! Gorgeous! Where is the bedside table in the top picture from? Those gingko leaves on yellow make a gorgeous wallpaper!! Beautiful rooms are always better with a vase filled with pink bougainvilleas or dahlias!